The Duomo is the most breathtaking monument in Milan. This exceptionally large and elaborate Gothic cathedral on the main square of Milan, is one of the largest cathedrals in Italy and Europe. 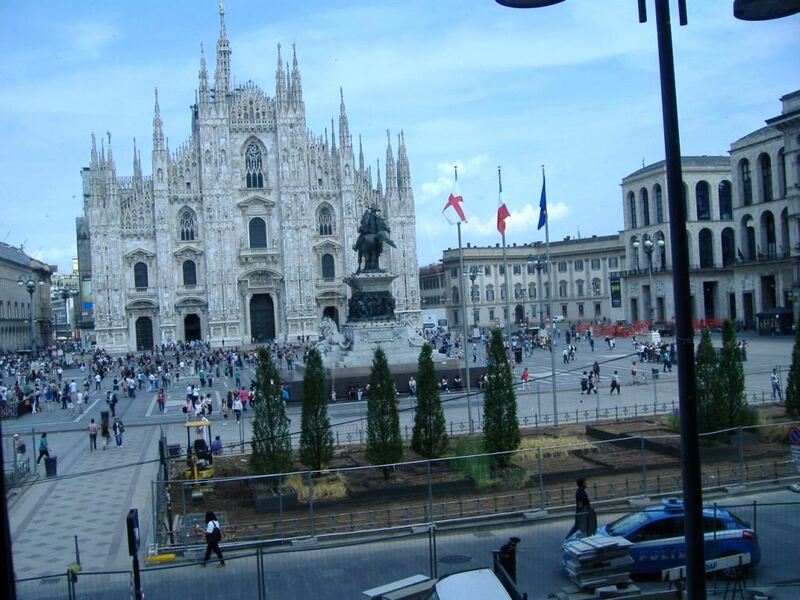 I have visited Milan in past years but this last visit to Milan for me was mostly about the Duomo. I spent several hours both inside and outside this magnificent cathedral. The Duomo is literally at the centre of Milan. The cathedral occupies a site that has been the most central location in the city since its founding. Duomo di Milano is one of the most famous buildings in Europe. Its dazzling white front facade, arguably the world’s most beautiful, dominates the cathedral square. The interior is expansive and filled with paintings. Visiting inside the Duomo is free. Take a look at the large stained glass painting depicting many scenes. Look for the horoscope symbols on the floor to the right. You can visit the grotto as well. You can hire a personal head-set to listen to the commentary and spend time listening about the parts that interest you the most. It would be easy to spend hours inside. Just sitting in one of the many seating areas and taking it all in, people watching or enjoying the beautiful feel of this cathedral is a lovely way to spend time. Walk around the exterior of the Duomo as well to see the stunning architecture and the sculptures. After exploring the inside, we paid a small fee to take a fascinating trip to the Duomo’s roof. The terrace view is amazing. You can choose to take the stairs or to go by elevator. Don’t waste time standing in the long queue at the main ticket office near the entrance as there are several other ticket offices around. One is in the Duomo Museum to the right from the Cathedral. When we were there, getting to the roof cost 7 euro to take the stairs and 12 euro to take the elevator. The roof climb provides a unique and memorable opportunity to walk high on the roofs of this huge Gothic cathedral. The views are magnificent and the opportunity to see the pinnacles and sculptures close up along the way is worth the climb alone. You can wander among the countless spires, arches and statues, (I’m told there are 200 spires & 3,400 statues) where stone masons work continuously to repair and replace the intricate facade that took six centuries to complete in the first place. The roof is quite safe and should pose no problems even for those afraid of heights. The huge building is made of brick faced with marble from the quarries that Gian Galeazzo Visconti donated in perpetuity to the cathedral chapter. A truly magnificent building, worthy of the title of “Duomo”. The courtyard stands surrounded by other great architectures such as the Galleria Vittorio Emanuele shopping centre. I love the Duomo. I especially love the wonderful leadlight it is magnificient. Thanks Susan, it is so stunning and special. It is amazing how intricate the details and the massive size of the duomo is impressive. Linda it is amazing, particularly when this was built many hundreds of years ago. The view was outstanding Kay. I am so pleased that I went up. As I walked up the steps from the Railway Station to daylight, there it was glistening in the sunlight, breathtaking, unbelievable like a layered wedding cake. It took my breath away and there I spent most of my time in Milano. A must for the Italian traveller. I love Milan and Duomo! This is a city with a lot of taste and fashion. Have you gone up on the roof of Duomo. Great piece on the Duomo Lyn. I loved your photographs showing the Gothic details so clearly. Perhaps we could have one on Notre Dame or Chartres………..Thank you! Beautiful. Amazing what detail people of the past put into the things they built. Beautiful :) It’s like a dream. I hope to travel to Italy – the architecture is amazing! It certainly is a magnificent piece of architecture!! Your post very aptly describes it! Hi there Lyn! Nice to see your continuing adventures further up the top of your blog. Where are you now, and where are you off to next? I’m glad you thought my post, a few weeks ago, about the trolleybuses encircling Milan, was interesting enough for you to like it. I see here that you’ve been to Milan before. If you ever have to pass through Milan again, just contact me and I’ll make you a personal plan for the best area in Milan suited for you and the best places to eat there! Or you can just check out my other main blog [ http://www.milanfinally.com/ ]. If you ever wanted to further promote your own blog (at least in the eyes of Google), I am thinking of offering a Guest Post proposal to you (I was thinking maybe if you had some doggie pictures taken in Milan, you could make a short re-write for Milan similar to your previous post on Dog Watching). Contact me on at the email address I’ve provided, or at my blogs (as I don’t see any page for contacting you privately on your blog), and we can take things from there. Look forward to seeing more of your world travels!